I suffered from severely painful patellar tendinitis for 5 years. Now I can complete 100-mile bike rides pain-free. I credit my success to "eccentric exercise." Through trial and error, after reviewing the medical literature, I found a regimen that helped me eliminate knee pain. Do not do these exercises if you have inflammation and until you consult with medical professionals to determine whether these exercises are appropriate for you. In addition I highly recommend rolling one's quadriceps and IT-band on a "foam roller." I recommend doing 10 or more rolls (back and forth) twice per day. Regular professional massage can also help the IT-band, as well. thanks for your site, it's been great in my journey to recover from the exact same injury (cycling induced tendinitis). 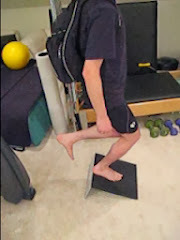 The "quadriceps" stretch that you show here causes great pain for me, and it is frustrating that I have not found a solution to address my tight quads which I believe led to the problem. A few physical therapists have shown me other ways to stretch, but I cannot feel a stretch in my quads using these methods. I have started to use a roller, but it feels very different than a true quad stretch. Do you have any advice for how to do this? Unfortunately, there's not much else apart from the traditional quadriceps stretch to really get at the muscle. Perhaps, you can try to do the stretch for 1) a shorter duration and 2) using a lighter pull as you stretch. If this works, you can ramp up over time from there. You can also try taking a 1-2 week break before re-trying to stretch it. I also highly advocate foam rolling the quadriceps. Perhaps you can increase your foam rolling of the quads to several times a day and for a longer duration each session. You can get one type of foam roller with a hard, yet hollow cylindrical core to really feel it work your quads. hey, thanks for all the great information. Would you recommend stretching before or after the eccentric exercise in the evening? First, ideally you should stretch everyday, in my opinion. Second, whether you should stretch right before or right after the eccentric exercise may not matter. You could even stretch both before and after if you have time. If I had to choose before or after, I'd choose after. Perhaps, surprisingly, I have generally found my knee tends to feel better when I stretch after other kinds of exercise, such as bicycling, than before. You can experiment and see which you prefer, as well. Thanks for your reply, I have been stretching twice a day and the tendon is definitely improving. I was wondering, when do you know that you can start exercising again? I know it's important to start again slowly, such as swimming then cycling, would you advise that I do no exercise until I get nearer to 20 pounds? I am up to 4pounds 1 leg squats on the decline board, and because it was feeling stronger, I thought some gentle front crawl could help. But last night a felt a little more pain doing the squats, and today going down stairs there is a small amount of pain. Near-term, since you are feeling some pain doing the squats, I would take a break from the eccentrics for a couple of days and then restart at a weight a little less than the last weight you were using, so perhaps 3 1/2 pounds in your case. If the pain continues, then you may need to take a longer break and then reduce the weight further. Assuming you get back on track without pain while doing the eccentrics, then you can consider some other exercise like cycling or swimming. I would significantly limit, or refrain from, other exercise for the first 2 to 4 months of starting the eccentric protocol. Then, after this period you can test out some other exercise, even if you have not reached 20 pounds in the backpack. I would start off easy with only maybe 5 minutes of exercise and see how you do. I would add another 5 to 10 minutes every few days after that and see how you do. It may be a bit of trial-and-error, and you may need to again take a break for a few days from the eccentrics if you have a setback. Hopefully, you have consulted with a physical therapist and/or doctor about your condition and decision to embark on the eccentric protocol. Will eccentric exercise cure you? What exactly are eccentric exercises? See Iceland! Click here for my photographs! If you like this website and have found it helpful, please donate by clicking the "donate" button. Thanks! Google's use of the DoubleClick cookie enables it and its partners to serve ads to you based on your visit to this site and/or other sites on the Internet.